An exhibit of works in varied styles, media and subjects created by members of STAAA. Opening Reception during First Friday Art Walk, April 5, 5-9pm; Awards at 7pm. Artwork of any style, medium, subject may be entered. Limit 1 entry | Judged for awards only. All entries will be included. Limit 1 Entry | Judged for awards. All entries will be included. 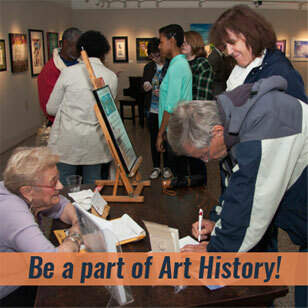 Featuring over 100 pieces of art created by students in grades 6-8. This community outreach partnership exhibit with the St. Johns County Schools features over 100 works of art by students in grades 6-8. Teachers will drop off their students’ artwork. Teachers will pick up their students’ artwork. Original paintings created during the 2019 3rd Annual St. Augustine Plein Air Paint Out are featured in the main gallery. These original works capture the historic, coastal and architectural beauty of the nation’s oldest city. Submitted artwork must have been created during the 3rdAnnual St. Augustine Plein Air Paint Out. Limit 3 Entries | Judged for entry & awards. 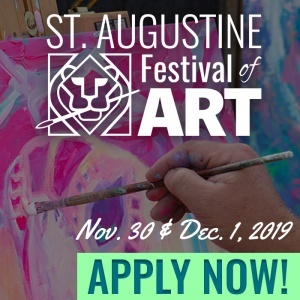 The St. Augustine Art Association has been promoting excellence in the arts since 1924. Located in the heart of the nation’s oldest city, STAAA is a vibrant non-profit art organization, recognized as the cultural epicenter of local art community. STAAA produces monthly juried exhibitions, solo and group exhibits, lectures, workshops, walking tours, children’s programs and more. STAAA holds a Permanent Collection of signature St. Augustine art, including works by the organization’s founding members known as the Lost Colony. Admission to the art gallery is free.